I have been working directly for the foundation since 2001 and was named the Executive Director in 2009. I bring twenty years of outside experience in the marketing and advertising industry to the NAP. I attended York College of Pennsylvania, where I majored in Graphic Design, minored in both Fine Art and Art History and graduated with honors. In 2007, after a successful career in event planning, I rekindled my passion for the arts and joined the National Arts Program Foundation. I graduated from Rowan University with a Bachelor of Fine Art; concentration in Photography and Printmaking. From there I obtained a Master’s of Science in Arts Administration from Drexel University with the goal of bringing forward art from the community. I chose this piece for a number of reasons. The first being that I am a big watercolor fan and always have been. The artist, Ria Redifer, painted images to capture those moments that can never be defined, rather can only be hinted at. It is the reason why this painting is one of my favorite. The red coat of the rower stands out among the greenery in the background. The rower could be in a large boat, or it could be smaller, the shape is implied. The paddle is gliding through the water and just about to be lifted or is it being used to turn the boat, not really sure. 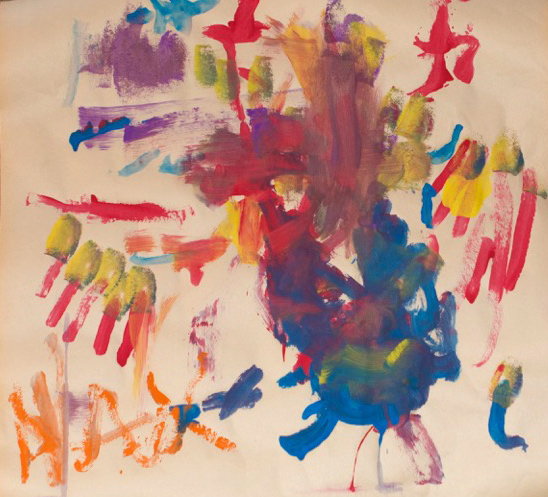 The painting pictured was created by my energetic three-year old and presented to me as a gift on my last birthday. This colorful creation is prominently displayed in the kitchen right now. Although our hectic daily routines often leave little free time, I try to incorporate a creative session with the kids whenever possible. My featured selection is a guitar designed and executed by my husband and I for the “One Night, One Cause” art guitar auction. The finished product was a true collaboration of our own artistic styles, spray paint and sewing, creating such a distinctive piece that the head of Paul Reed’s custom shop personally commented that this was the first time he had ever seen a guitar mounted and wrapped in fabric.